Scott Henry Schiaffo was born in Passaic, New Jersey. He currently resides in Bergen County, New Jersey. Schiaffo is an actor/musician who plays guitar, keyboards, bass and harmonica. He is best known to independent film fans as the "Chewlies Gum Guy" from Kevin Smith's 1994 independent cult classic Clerks. Schiaffo has appeared in several feature films as well as many shorts since his big screen debut in the seminal cult comedy classic Clerks. He's appeared in films alongside Michael DeLorenzo in The Garden State and SELMA BLAIR in The Broccoli Theory. He was featured in the View Askew produced - Lions Gate distributed motion picture "VULGAR", which enjoyed a run in art house theaters on both coasts. "VULGAR" has gone on to become a cult film and remains highly controversial. 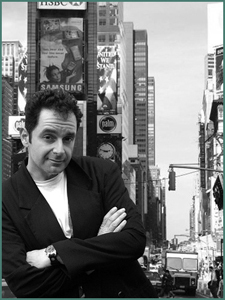 Schiaffo appeared as Detective Mike Tobin in New Artists Productions LINGER. LINGER was screened and featured in the Big Apple Film Festival and was very well received. Scott played the lead, Mo Fletcher in IDIOTS ARE US which won BEST COMEDY FEATURE at the New York Film and Video Festival. In 2011 Schiaffo appeared in Tom Zanca's "Echoes & Voices" and in MPR Films "Don't Shoot" both titles are available for purchase on Amazon. In July 2011 "Don't Shoot" won "Best Low Budget Short" at the Jersey Shore Film Festival. "Don't Shoot" will also be featured in the Big Apple Film Festival November 2011. Visit Scott on the IMDB for extensive credits.